Blue Bloods begins tonight with Danny (Donnie Wahlberg) assuring his son, Sean (Andrew Terraciano) they will make their own traditions like he did with his other son, Jack (Tony Terraciano) after they burnt their entire breakfast; neither of them were able to get hold of Jack as Sean comments Jack was at a party the night before. Eddie (Vanessa Ray) talks to her partner about Jamie (Will Estes) and how he used to be her partner; she assures her that he isn’t as tightly wound as they think he is. Their chat is interrupted when a kid attempts to break the door down of a convenience store, both insist there is no beef and it’s just a neighborhood thing. Eddie’s partner tells the kid to get lost, and reminds Eddie there are cameras filming them everywhere and she doesn’t want to end up on a documentary. Abigail (Abigail Hawk) calls PC Frank Reagan (Tom Selleck) to let him know Inspector Kimura is there; she’s there about “static” she has been hearing about her promotion. She knows as an Asian female she doesn’t have much of a tribe in the NYPD, but he assures her he is one of her friends and she says the static is not deterring her from putting in for her promotion as Deputy Chief. Danny and Dt. Maria Baez (Marisa Ramirez) arrive at a murder crime scene at a college frat house, again Danny can’t understand how they are partying on a Sunday night. Meanwhile, Eddie and her partner, Officer Thomas talk about their lives when they are called back to the store they just left. As they arrest the boy for assault the owner’s wife, he says they owe him money but the crowd is furious demanding their names and badge numbers for not taking him earlier. At the frat house, Danny and Baez come out wanting to question the witnesses, who were not separated by the unis. They know his name was Peter Jones and he was pledging. They woke up, he fell off the couch and hit his head; one of them says this is a victim less crime and they are not responsible. Bobby in the back admits they were serving alcohol, but it was off limits to the pledges. Danny informs Peter’s parents that he has died, forcing the frat boys to watch. Anthony (Steve Schirripa) visits his mother, learning she has had several tests done and confronts the Director of the facility why he wasn’t notified, they promise to reach out to him next time. His mother is upset, saying they don’t need cops around there. Sid (Robert Clohessy) joins Frank in his office. He does reveal that several Captains are bitching about being passed over and are old school, thinking Jane Kimura shouldn’t get the promotion. Garrett (Gregory Jbara) barges in telling them an Inspector Keith Sullivan has reported discrimination to the media; Frank and Sid exchange concerned looks. Baez and Danny are on their way to see ME April Watkins (Christine Renee Miller) when Danny leaves Jack his 5th message for the day. April reveals Peter had 3 times the legal limit of alcohol in his system but what killed him was blunt force trauma to the head but he had to be at least 10 stories high, not falling from a couch! Danny and Baez inform the parents that Peter’s death is now a homicide and wonder if Peter had any enemies. His dad admits the fraternity was his idea, even though Peter didn’t want to be in it; after they leave, Danny feels maybe Pete did this to himself and suggest they speak to Bobby. 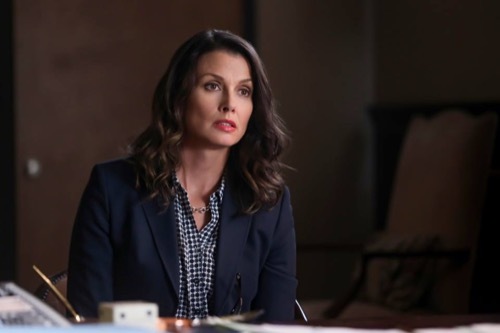 Erin (Bridget Moynahan) finds Anthony in his office and asks him about Blue Sky Retirement Center; he asks her to let him open a case on the home, explaining how they are running tests on his mother that are unnecessary and no one is doing anything until someone dies. Erin asks what he wants her to do, he wants her to look the other way for now. She walks away, like her asked. Jamie demands answer from Eddie and her partner, Mia. Eddie says it was a “by the book” stop, that ended up sideways but he says the store owner begged them to arrest the kid and they refused. He says there is a dispute what happened on the first call and what isn’t in dispute is that a woman is in the hospital because of the second call; he removes them both from their seats and both are placed on foot patrol until further notice. Danny and Baez find Bobby on campus, needing to know what happened to Peter, revealing they know his skull was caved in. Bobby confesses that he saw Peter go into the basement with Colin (Eric Freeman) to get a fresh keg, but he only saw Colin return with Mike; Peter wasn’t with him. Bobby says there is a video of the party and gives them his phone with the video on it. Mia chastises Eddie, saying she was right about Reagan being a hardass. She doesn’t feel it’s fair they have a foot post but Eddie says he is just doing his job and Eddie defends Jamie, causing Mia to walk away saying she knows this precinct way better than either of them. Frank goes to see Sullivan at the bar, saying he didn’t get passed over; he belongs in firearms and tactics. Sully feels Kimura stepped right over him and it was his turn, but Frank reminds him there is no turns. Frank asks him not to do this as Sully says it is 2018 and the new wisdom is a younger Asian female is the better candidate than the older white guy. He demands for Frank to call it what it is; Frank advises Sully to listen more, but he says he isn’t bending to these winds. Frank would hate to lose him since he has a lot of good years left. At the HQ, Danny and Baez watch the video, where Colin and Peter walk down the stairs in the background. They learn that Mike has Colin in every single one of his posts, but if you look at Colin’s social media, you wouldn’t even know that Mike existed; making both Danny and Baez wonder about things. Jamie confronts the store owner, Jose (Nelson Ascencio) about lying to him, believing he was employing Luis, the kid, without paying him because he is an illegal. Jamie reminds him that is called slavery and it’s been illegal for about 150 years. Jose says he was giving him sandwiches, which was a kind of pay. Jamie tells him to come to the station and clear things up, giving him 2 minutes to close up the store. At Blue Skies Retirement Center, Henry “Pops” Reagan (Len Cariou) visits Anthony’s mother, who readily admits they treat her well but they give her so many tests. Henry acts like he knows another elderly man who is hooked up to IV pole, asking him how he is doing. Henry leaves with Anthony and tells him it is like they are running a placebo clinic in there; the man hooked up to a IV bag filled with saline solution, told its a life saving cure. The doctor is a Brian Jr, whose father was the doctor who died 9 months earlier and Brian is only a nurse. Henry realizes how lucky he truly is. Jamie and Eddie are out for a bike ride, when he talks to her about their job. He tells her they are turning the entire precinct around, one cop at a time; but there are going to be moments where there is crossfire. At the Reagan family dinner, they made all of Jack’s favorites to remember him while he is off to college. Henry tells them all he doesn’t want to hear any complaining and he doesn’t like snark as they should all be grateful. He reveals he visited a nursing home the other day and it was so depressing. Erin asks if it was Blue Skies, but he swears it was sunrise or sunset something; he just wants them to know how especially blessed he is. He refuses to look Erin in the eyes as they say grace, but she knows. Frank meets with Inspector Kimura, informing her that he spoke to Sully and hopes she knows what she is in for if they proceed. She says, “Chink. Slant. Gook. Nip. Charlie. Slope. Tokyo Rose.” She has heard them all before she was 10 and even if she heard them in his department, they would not affect how she does her job. He wants to know if an “Atta Boy!” from someone like Sully would feel good, and she admits it would feel good simply because it came from a fellow cop, not because it came from it came from an Irish mug. Eddie and Mia come to see Jamie in his office, where he apologizes if it seemed like it didn’t have their back. He explains what happened but reminds Mia that her instincts cannot be driven by whether she is being watched or recorded; asking them to trust the system. Mia thanks him for taking the time and finding out the truth. Danny interrogate Colin, who says Bobby is a liar while Baez questions Mike. Danny rushes in with a file saying it’s a lot easier as Colin told the truth, telling them Mike and Colin were hazing Peter and Mike lost control. Colin tried to stop him, but couldn’t. Mike blackmailed him into covering for him. They excuse themselves and return to Colin’s room, where Danny tells Colin the same story. Colin says he took Peter to the basement to give him some cocaine and he is actually the victim. Peter tried to kiss him and he lost it, shoved him and he fell never getting back up. Danny arrests him saying he can tell the rest to the judge. Henry and Anthony watch from his car as forensics and NYPD arrive at Blue Skies. Henry reveals that he thinks Erin suspects he had something to do with this, saying he inadvertently said something at dinner. He feels they should tell Erin together and Anthony says he is taking his mom home to live with him. Sid shows Inspector Kimura how the ceremony will proceed as she becomes the new Chief of Training for NYPD as Frank watches with a smile. Abigail walks in as Sully asks for a moment and Frank allows him to walk in, he tells Kimura it was nothing personal and congratulates her; shaking her hand. He removes his badge and stars, saying it just isn’t right telling Frank he will see him in court. Kimura returns to what she is supposed to do, without hesitation. Frank looks at Sully’s badge with a deep sigh, but stands up and follows Sid and Kimura out.